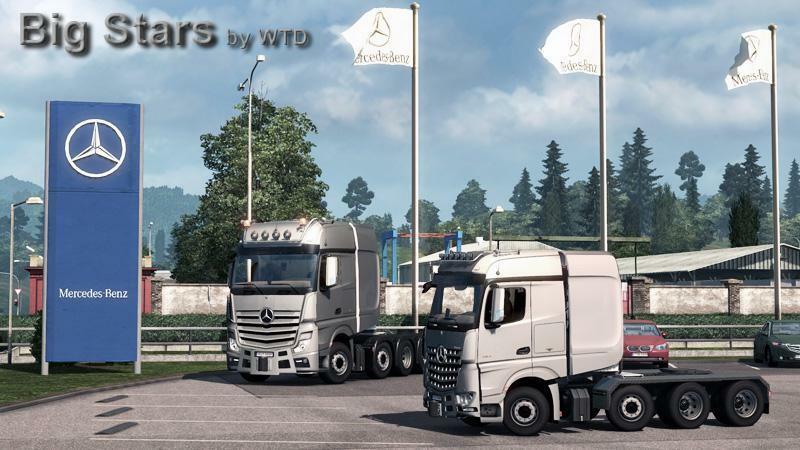 Mercedes-Benz Big Stars - Actros/Arocs SLT v1.5.3.4 (1.32.x-1.33) for Euro Truck Simulator 2 game. - This mod adds 2 standalone truck Mercedes Actros and Arocs. – Fixed missing beam while using auxiliary roof lights. Changed range of “worklights” (additional reverse lights) at the rack/tower. Added battery box and rear hitch (by scs) as low poly variants. Marked as “LP” for low polycount and “HP” for high polycount.